Walking and trolley tours return summer 2019! Eerie Nights is a theatrical story telling experience where guides in special effects make-up, period costume and in the character of a Richmonder from the 1800's or 1920's will lead you to several historic and haunted sites on our walking (or) trolley ghost tours. At each site they will tell tales of the history and paranormal activity associated with the location. Our tours are geared towards a mature audience but families are welcome. Ghoul Guides will provide a creepy and bawdy experience throughout the tour (no cheery tour guides found here). Children under the age of 16 must be accompanied by an adult. We encourage you to take lots of pictures, but audio/video recording is not permitted. While touring: Smoking, the consumption of alcohol / drugs, the carrying of guns or weapons are not permitted. Service will be refused. Pets are not allowed on the ghost tour, excluding service dogs. Expect to discover a part of Richmond’s history that will surprise you, thrill you, and we promise - scare you enough to leave you wanting more! Eerie Nights walking tour involves walking for a period of up to an hour and a half with your very own ghoul guide from the 19th century. You will visit several historic and haunted sites and be told about the history and haunts of each location. Participants should be in good health and we recommend comfortable shoes. As the tour takes place outside, participants should dress appropriately for the weather. June - September: Friday nights at 8:00 p.m. | Saturday nights 8:00 p.m.
October: Friday nights at 8:00 p.m. | Saturday nights at 8:00 p.m. & 10:00 p.m. Climb aboard our haunted trolley and meet your recently unearthed guides who hale from 1920's Richmond and are dying to take you back in time. Discover the dark secrets and long forgotten horrors that lurk in the shadows of one the Nation's most haunted cities. 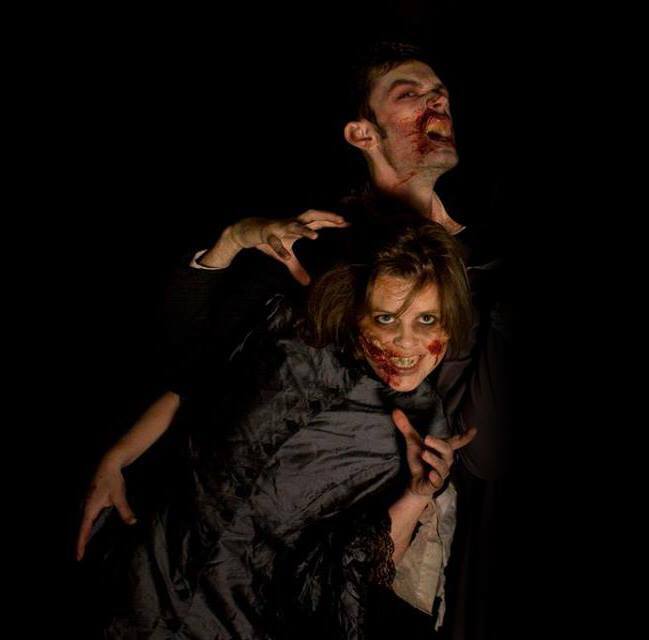 Ghouls Ghost Tour is a two hour theatrical story telling experience on wheels and stops at different sites from our walking tour. •August - September: Saturday nights at 9:00 p.m.
•October: Friday & Saturday nights at 9:00 p.m.
Online ticketing closes at 7pm the evening of a tour. You may still purchase tickets on site at our ticket booth the evening of a tour by CREDIT CARD ONLY. All tickets are NON-REFUNDABLE; the tour leaves rain or shine. *The purchase of a ticket for the Eerie Nights ghost tour indicates that the ticket holder understands that there are potential risks associated with participation in the Eerie Nights ghost tour. In consideration and acceptance of participation in the Eerie Nights ghost tour the ticket holder agrees to release the operator, affiliates, officers, directors, and employees from any liability, harm, injury or death, cost or expense whatsoever that may arise directly or indirectly from attending and participating in the Eerie Nights ghost tour. Interested in a private tour? Contact us for private tour details. Tours depart the *Main St. side* of the 17th St. Farmers Market. Ticket booth opens 7:15 p.m. Interested in a private tour or need more information? Use the form below to send us a message through the ghost post.